The 859GL-80NP/C/T is an 8" monitor that features VGA input, high reliability and an incredible price. The 4:3 aspect ratio on this 8" monitor makes the 859GL-80NP/C/T ideal for broadcast, CCTV and factory automation applications. 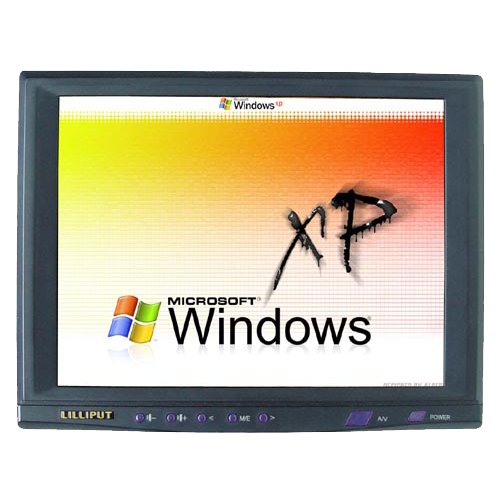 Lilliput monitors are always two steps ahead of the competition. The 859GL-80NP/C/T uses the latest LED backlight technology, and the results are stunning. This 8" monitor boasts a beautiful, vibrant picture - perfect for pro video, broadcast and surveillance customers. Despite the mini size of this 8" monitor, it supports industry-standard resolutions. Natively 800×600, the 859GL supports resolutions from 640×480 up to 1280×1024. The 859GL-80NP/C/T (touch screen model) is our most popular 8" monitor with touch screen. Taking the compact size and features of the standard 859GL-80NP/C, this touch screen model opens up a whole new range of applications. The 859GL-80NP/C/T is a hugely popular 8" monitor due to the support with a variety of AV devices. It includes a VGA and two composite video inputs, so can be connected to devices including computers, CCTV cameras, broadcast cameras and much more. AV connections are all provided through a small and secure breakout cable. This convenient cable prevents cables falling loose, as well as making the monitor easily detachable from all connections. Customers are pleasantly surprised when they hear they price of this 8" monitor - they are then delighted when they experience the picture quality and performance! The 859GL represents Lilliput's dedication to superior value. Compare this price/performance to our competitors and the choice is clear!